Andrei Ryabushkin especially loved Slavic mythology. He traveled a lot and studied the epics of the Russian people and tried to draw reliably some of the characters. In 1895, he painted a portrait of a fictional character – Mikula Selyaninovich. In the epics of the Novgorod cycle a lot of stories were mentioned with the participation of this famous hero who loved to plow the land. Drawing it, the author wanted to convey the simplicity of the people and its unlimited power. According to folklore stories he has two daughters and immense love for the Russian land. Wore Ryabushkin hero in a completely simple shirt and trousers trousers. Drawing this handsome man, the artist sought to convey the tranquility of the whole nation. It is known that always enough, but not a single enemy managed to break the spirit. Mikula on the canvas looks into the distance, as if examining the open spaces and makes sure that the enemy does not run from distant hills. In the background, a horse is peacefully grazing, resting from arable land. This is proof that the Russian people live only by their work. Processing the field, grow grain and get fragrant bread. So the hero is not afraid of this work, he boldly harness his warhorse and plow the black earth. Cultivating her, he feels peace. This is clearly visible on his broad face. A light breeze plays in the hero’s hair, on top of which lies a hat, familiar to all men of that time. The shirt exposes his powerful chest a little, and hand embroidery flaunts on the hem. Hands strong, able to lift the exorbitant earthly cravings. Ryabushkin Andrey portrayed a true epic hero, this sketch became the cover of a book about famous Russian warriors. 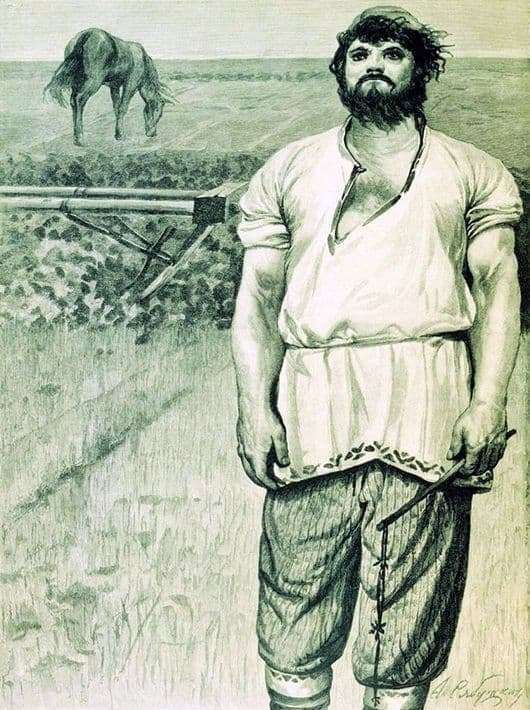 People liked this image, which was so close to the ordinary working peasant. It looked like folk heroes who were no different from ordinary villagers.